Ola, the cab-hailing company today announced a new service, dubbed as ‘Chalo Befikar,’ which is an in-trip insurance program. 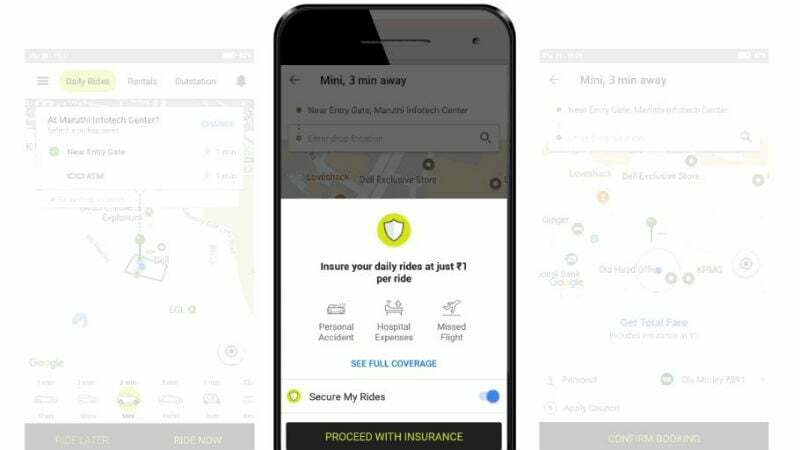 Under this new in-trip insurance program, Ola is providing cover up to Rs 5 lakh for claims such as missed flights, accidental medical expense, loss of laptops or baggage and more. Ola has introduced this service in collaboration with Acko General Insurance across 110 cities in the country. The company also confirmed that it would be extending the Chalo Befikar Insurance service across all modes of transport such as auto, e-rickshaw and cabs. The insurance cover can be purchased for as low as Re 1. While booking a ride through the Ola application, users will be asked to select in-trip insurance cover (of course, it’s optional if you don’t need it). Ola has set the prices as Re 1 for all the city travels, Re 10 for Ola Rentals and Re 15 for Ola Outstation rides. And the claims should be done through the Ola application, Acko’s website & mobile app and as well as Ola’s customer support team. The Chalo Befikar in-trip insurance service of Ola will cover daily hospital allowance of up to Rs 500, accidental media expense of Rs 1,0000, ambulance transportation of Rs 10,000, missed flights of Rs 5,000, loss of baggage up to Rs 20,000, the accidental death benefit of Rs 5,00,000 and more. Ola also stated that the service would be rolled out all the cities where it’s operating in the coming weeks. “We are thrilled to introduce in-trip insurance for our customers under the ‘Chalo Befikar‘ insurance program. Just for INR 1, Ola customers can avail an insurance policy of INR 5 lakh which will also provide cover for missed flights, loss of baggage, loss of a laptop, emergency hotel requirements, and many more. The launch of this initiative, a first of its kind in India, reiterates our resolve of building customer-first solutions,” said Vishal Kaul, Chief Operating Officer, Ola. Furthermore, Ola confirmed that its partnership with ICICI Lombard General Insurance would be official in the next few months. The Ola in-trip insurance toggle should be enabled under the Ola application. The option is hidden under Profile section. All you need to do is turn on the Ride Insurance toggle and do make a note that once enabled; you’ll be charged for all your future trips. So, if you just need the service for one trip, turn it on and turn it off immediately after the trip. Optional? They have made it opt-out rather than opt-in. Additionally, the opt-out option is hidden inside the side menu, in the profiles. Most people in a hurry will not even see the extra charge and blindly book. For most people, the extra charge is not much, however, they can give a checkbox at the booking time, when this might be needed.